The Astronomy Group currently does not hold monthly meetings but does post a monthly ‘Astronomy Newsletter’ with up-to-date and pertinent information for astronomers. Val received a query from a reader about the Harvest Moon. It occurred to me that others of you may be interested in this. Many people think that the Harvest Moon occurs in September and the Hunter’s Moon occurs in October. This is often the case but not always. A Harvest Moon is the first Full Moon after the Autumn Equinox. The equinox this year occurred on September 22nd. There was a Full Moon on September 6th. The Moon takes 29.5 days to orbit the Earth and so the next Full Moon after September 6th is October 5th which was the date of the Harvest Moon this year. Sometimes the Harvest Moon occurs in late September and sometimes in early October. But why is this called the Harvest Moon? On average the Moon rises 50 minutes later each day but at this time of year it rises only 30 minutes later each day. 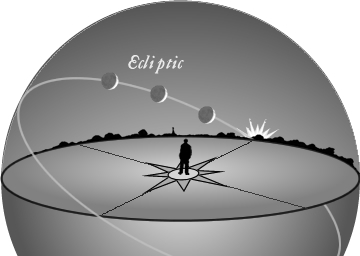 This is because the Moon’s orbit is tilted at an angle to the Earth as shown in the image below. The Harvest Moon is low on the horizon and stays in the sky for more nights than most Full Moons do. It therefore gives a bright light for several nights so the farmers can get the harvest in. Also because it is low down in the sky it looks very big. This is an optical illusion. It also looks reddish. This is because the Moon’s light has to travel through more of the Earth’s atmosphere since it is low down on the horizon. Blue light gets scattered by the atmosphere but red light can pass through it. This gives the Moon its reddish tinge which makes it a beautiful sight. The Hunter’s Moon is the first Full Moon after the Harvest Moon which this year will be on November 3rd. Finally what is a Blue Moon? This does not mean that the Moon is blue! The Moon only gets a bluish tinge if there is smoke or dust in the atmosphere. These days this term is used to describe a second Full Moon in a month. In 2015 a Full Moon occurred on July 2nd and another on July 31st. This second one was a Blue Moon. Note that the next one will occur on January 31st 2018. However there is an older “seasonal” definition of a Blue Moon Usually only 3 Full Moons occur in a season which is 3 months. However sometimes 4 Full Moons occur in a season and the 3rd one of these is known as a Blue Moon. The last one of these was on May 21st 2016 and the next one will be on May 18th 2019. The term is used to indicate a rare event. One thing a know for certain is that they only occur “once in a Blue Moon”!